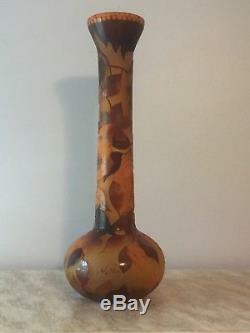 This exquisite vase is 20" tall, 8" at the base and 3 wide around neck. The opening measures 4,5. 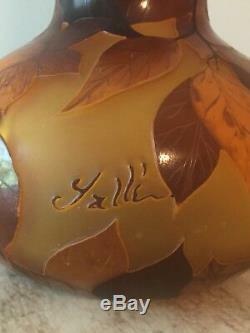 Vase has an original signature. This stunning vase has beautifully detailed foliage in relief above the frosted acid-etched cameo glass background. The background has an amber color with brown and orange foliage that covers the neck and middle section and extends to the rounded lower section of the body. 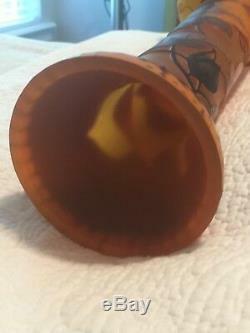 This piece is in excellent condition with no chips, cracks. This is a true collectors item! 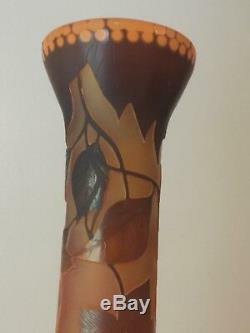 The item "Emile Galle cameo tall vase signed Amber/Brown/orange color great condition" is in sale since Wednesday, August 8, 2018. This item is in the category "Pottery & Glass\Glass\Art Glass\French\Emile Galle". 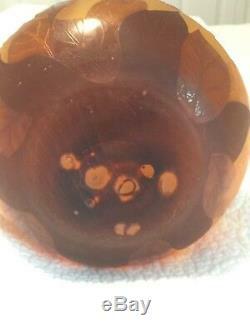 The seller is "rosialexande52" and is located in Fleming Island, Florida. This item can be shipped to United States.